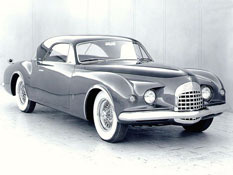 Built as an experiment and a study of forward styling, the K-310 car was entirely designed and styled in Detroit by the Engineering Division of Chrysler Corporation. The over-all styling of the K-310 was characterized by its small grille, closely centered about the car centerline, graceful hood line matched by the elegant sweep of the deck lid, and the two-tone effect which integrated the upper and lower structure giving the illusion of still greater length and even less height. As a matter of interest, the over-all length of this car was 220-1/2 inches and its over-all height was only 59 inches. In spite of its low appearance, it should be noted that the road clearance was approximately 7-3/4 inches, which was comparable to that of production models of the day. The car weight was approximately that of a Chrysler Imperial Newport. A companion engine for the car was the K-310, a forward development from the standard 180-horsepower FirePower V-8 engine in production Chrysler models. The experimental K-310 engine had the same cylinder block, same bore, the same stroke, and the same cylinder head as the production 180-horsepower FirePower engine. Valve timing was altered, four carburetors mounted in place of the one dual carburetor normally used on the production engine, and an extra coil added to the ignitionsystem. Larger valves with accompanying larger streamlined valve ports and new freer-breathing intake and exhaust manifolds were installed. Because of the larger diameter valves and a slight increase in piston height, the compression ratio of the K-310 engine was 8.1:1, as compared to the 7.5:1 compression ration of the production FirePower engine. All of this power increase was accomplished without supercharging. There were a number of interesting styling features in the K-310 car. One instance is the use of flush door handles. When the thumb was pushed against the knob at the rear of the latch, the handle pivoted out so that fingers could grip it and pull open the door. A further example is the type of seat arrangement for the front seat occupants, which was unique in that the seat back of the K-310 was divided off center, with the result that the driver and center passenger need not be disturbed when someone wanted to enter or leave the rear seat. In addition, the front seat was built so that as either section of the seat back tilted forward, the corresponding section of the seat back also slid forward to provide more convenient access to the rear seat.